Amina Academy is a Registered Training Organisation that has been providing quality training for the last 9 years. 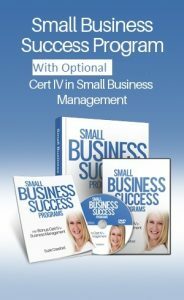 We are proud to soon be offering our unique “Small Business Success” Suite of Programs that will give you the resources, support and actions to work on in every area of your business. “Running a Registered Training Organisation for many years, we have found that most small business owners and entrepreneurs either don’t work on their business at all, (they work in it), and often have had no effective business training. There are incredibly expensive courses out there, that we feel are often over priced and are often more academic as opposed to action based. Many School leavers are tempted by loan schemes and pay over the top for a business qualification, whilst existing owners just do the best they can do. There are those that leave their program of study in a particular area, and go on to open up their own business, but do not have the knowledge, the skills and support to apply the necessary action to get results, and then often fail in business as a result. This is very sad we feel, as it means their dreams and passions can often be shattered. That’s why we have put together a very cost effective but action based program that has a strong focus on achieving success in all the areas you need to be in control of as a business owner. It’s our aim that with the resources in this course plus the live trainer support, emails, newsletters, interviews with the experts and consistent action from yourself, RESULTS WILL FOLLOW! This accredited course is offered in partnership with Amina Academy Pty Ltd, a registered training organisation (provider number 31532). The Venue Management School gives students a unique opportunity to experience quality education via a product of integration; whereby reading, research, listening and discussion combine to deliver the ultimate learning platform! Whilst completing a Diploma with VMA you will truly learn from both industry experts and most importantly, their industry peers. To undertake the Diploma of Venue Management you must have been working in the venue industry at operational supervisory level for a minimum of two years. As the program is industry specific and part of the course requires workplace activities and involvement in research and case studies only venue industry employed participants can be accepted. The learner will need an in-depth knowledge of the venue industry and have developed fundamental skills in venue operations to understand and apply the assessment requirements for this qualification. Participants of this course should have a high level of English language, literacy and numeracy skills sufficient to interpret complex documents, prepare and present written reports and documents and prepare budget spreadsheets. You are welcome to call us for an informal chat about getting started with the Small Business Success Program, the Diploma of Venue Management or any other business related enquiry on 07 55974066 or mobile on 0437 827 228.